I went to New York City in August 2011 together with a friend. 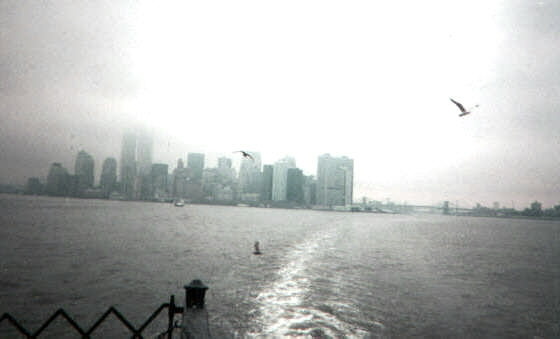 It was the second time, I also visited NY in march 1998, this time alone, 3 years before 9/11. New York is still the same city, but the experience was a lot different; the old WTC twin towers are not there anymore, but the sun was shining, the trees were green, a lot of new skyscrapers have been added to the magnificent skyline and I had a new digicam to shoot with. Back then I was only 19 years old and I was there alone. It was grey, the trees had no leaves, I had a bad camera and didn’t care much about taking photos, but the city had still not witnessed the worst terrorist attack in history! So it was good to see that activity was going on on Ground Zero, once again making One World Trade Center the tallest building of New York. It is also good that they are building a memorial there. We arrived in JFK Airport, the largest of New York’s 3 airports, and travelled by American Airlines via London Heathrow and Copenhagen. Further down the site you can read about our experience about the earthquake and the hurricane. More then 90% of the famous sights are located on the large island called Manhattan, bordered by Hudson River to the west and East River to the east. But it is only one of 5 so called boroughs, so I think every should leave Manhattan at least once if possible. The other boroughs are Brooklyn, Queens, Bronx and Staten Island and each one of them are large as a really big city! And then you have to add the suburbs, some of them located immediately to the west of Manhattan, in New Jersey. They are not counted as part of New York City, that lies in the state of New York. Manhattan is mostly flat and used to have more skyscrapers then anywhere else in the world, but have been beaten by many cities in Asia. We visited Midtown Manhattan several times since most sights are located there and it is somewhat of New York’s center, Lower Manhattan with the Financial District 2 times, Greenwich Village day and night, Chelsea every day since our hotel was there, Meatpacking District several times since it is part of Chelsea, Chinatown, Little Italy, Soho only once, Noho, Hell’s Kitchen once, Upper Eastside, Upper Westside, Eastside and briefly Brooklyn. Broadway, 5th Avenue, Park Avenue, Lexington Ave and Madison Ave are the most important avenues we visited. Especially 5th Avenue is impressive with Empire State Building, Trump Tower, Central Park, expensive brand stores (where we spot Brooke Shields) and all other sights. Broadway, that is famous for its theaters, is the only avenue that goes in a diagonal direction instead of a straight one. The rest of the avenues on Manhattan goes in a north-south direction and the streets from west to east and most of them are named with numbers, making it easy to navigate. The exception is Greenwich Village and parts of Lower Manhattan. Our experiences – exciting sightseeing! We went of the observation deck of Empire State Building in the night and Rockefeller Center´s GE Building in the day. The classic Empire State Building is once again New York’s tallest building, until the new WTC is completed in 2014. Of course we visited the new WTC site, formerly Ground Zero, in Lower Manhattan, the financial district of New York where you find Wall Street and the Stock Exchange. We made visits to famous buildings as Chrysler Building, Metlife Bldg and watched Woolwoorth Bldg from outside, but also payed attention to less know but interesting buildings. Brand new shiny skyscrapers in glass like Time Warner Center, 7WTC and Hearst Tower have been erected since my last visit. Times Square is of course a must in New York. It is more like a really long intersection where many busy avenues meet then a square. The flashing neon lights, the tall buildings buildings painted with advertisement and all the crazy people, make you think you are in a middle of a freakshow or a crazy, but exciting movie! And that is considered to be the unofficial center of the world’s unofficial capital! The only art museum we visited was Guggenheim. We also visited USS Intrepid, the aircraft carrier in Hudson River. At 3 occasions we went to Central Park, unfortunately in the late afternoon/evening all times. There are about 5 lakes in Central Park, a park that is twice as big as the country Monaco. But there are also many other smaller, but still nice parks (that are a bit like a mix of a park and a square); Bryant Park, Washington Square Park and Madison Square Park are especially nice. And we visited buildings were celebrities like Madonna, Jackie Kennedy, Bruce Willis, Steven Spielberg, John Lennon & Yoko Ono have resided, all located around Central Park. The contrasts are big in New York, even in Manhattan; rundown apartment buidings with shabby stores stand side by side with ultramodern glass skyscrapers. The diversity is even more obvious in Brooklyn. And the New Yorkers throw their trash in black trash bags right on the pavement even outside luxorious apartments; a very odd sight for a Scandinavian! The streets and pavements of NY are very worn with many cracks, but they are still clean, except for the trash bags New York is a clean city inside and outside. The subway is the most effective way of getting around but it is very worn and old fashioned the stations are extremely hot thought the trains are air conditioned and most station don’t have escalators. It is not near as dangerous as it was in the 70s though. The buses don’t work good, there are just a few lines and they stop in the middle of the street and you have to wave at them to get them to stop. Mostly old people use them. The famous yellow cab is a very popular way to get around. They are visible everywhere and they are not so expensive but could be expensive if you take them all the times so it is better to buy a metro card if your budget is limited. On some streets if could be hard to get one, you have to wave at them to stop, but most of them are already occupied. Unfortunately many of the classic Ford Crown Victorias have been replaced by ugly small Japanese cars. Ask any Titlemax rep which vehicle he would rather ride in, and he would definitely choose the Crown Victoria. Not only are the old Crown Victorias more spacious, but their Titlemax loan value is probably far greater than any boxy economy car. The citizens of New York are generally very friendly, very polite, positive in mind and don’t hesitate to help if you look for directions. It is easy to adapt in USA as a European, but there are 2 big cultural differences from Sweden that are somewhat annoying: you have to pay tips everywhere (not included in the price as in Sweden) and not even the tax is not included in the price, so you never know what the final price will be in stores and restaurants until you pay. The exceptino is fastfood restaurants. Even though the fastfood culture is big in America we tried some full service restaurants as well. think much about the earthquake, but my friend was frightened about the hurricane Irene that threated NY on Sunday night, the same time that we should leave USA by plane! Especially since our hotel was located in a mandatory evacuation zone, right next to Hudson River that were supposed to be flooded. Mayor Michael Bloomberg made everything to scare its citizens and evacuate to friends on the countryside or special evacuation shelters, just in case. So we rebooked our American Airlines flight for free and left The Big Apple already Friday night, instead of Sunday. I was persuaded. And that turned out to be a good decision in the end, since Bloomberg decided to shut down the subway, close all the bridges and tunnels connecting New York with the rest of the country and cancel all flights to and from the airports. So if we stayed we would be trapped on Manhattan in a super small hotel room in an evacuation area with no possibility to use the subway and really bad weather and our original flight was cancelled. The hurricane was downgraded to a tropical storm when it hit New York on sunday, but it was still too windy and rainy to do any sightseeing, and it would have costed us a lot of extra money to stay in New York for some extra days without being able to do anything. The worst was that we lost 2 days, and couldn’t visit Boston and Atlantic City, something I had been looking forward a lot to. It is still very cheap to buy a bus ticket to these cities from NY, but very expensive to fly there from Scandinavia, so it was really sad…I have never visited Atlantic City and I planned to make a photo update on Boston, since I only took 2 low quality photos during my visit in 1998. There was also a 5.9 earthquake during our visit with the epicenter near Washington DC, that was felt in some office towers in Manhattan, but we didn’t feel it (we were on Upper East side near Central Park then). We get to know about it as we passed by the GM Building at Grand Army Plaza and I watched a TV screen in the building by coincidence. We noticed that many people were standing and sitting everywhere outside the office towers; talking in their cellphones or working with their laptops that they brought outside. Extremely many people outside even by Manhattan standards. Very possible these where office workers that evacuated the skyscrapers because they felt the earthquake up high, that we couldn’t feel on the ground. There haven’t been a strong hurricane for almost 100 years (there was a small one in 1985)and I don’t think that any earthquake ever have been felt in New York, and now both happened during our visit. We didn’t feel any of them, but I got the feeling that even if there is an extremely low risk that bad things might happen, they will! Except for the earthquake and the hurricane we escaped from, the weather was good, it was warm and the sun was mostly shining during our visit. Sometimes it was too hot. Some evenings it was raining though, the first 2 evenings there were heavy thunderstorms and rains and even small floodings of pavements at Times Square at one occasion! So the weather was very dramatic. We stayed at the hotel Jane, one of the cheapest hotels in Manhattan. The location is perfect, in the small scale Chelsea, between Midtown and Lower Manhattan, a couple of blocks from Greenwich Village. Only a busy highway separates the hotel from Hudson River. The hotel is located in a nice historic redbrick building at Jane Street, one of few paving-stone in New York. It is a quiet street with townhouses and a lot of trees. The lobby of The Jane is a bit worn, but really elegant for the price with a chandelier and wooden panels, the staff were red suits, there is even an elevator guy and there is a nice French café (that is a bit expensive since you only get 2 baguettes,a juice and one cup of coffee for 9 dollars) and a nightclub that we never visited. The only disadvantage, a really big one, is that the room is so small that you can touch both walls at the some time! And we had to share a bunk bed, no king size beds here. So there was really a big contrast between our room and the hotel’s public spaces. But the small rooms had air condition (poor but still), 2 flatscreen TVs (one for each bed), a clock radio, and a phone.There was no view at all from the window since it was located at an opening inside the building. But it is not only bad to don’t have views of the street, the room was really quiet. The restrooms were shared, there were only 4 showers per floor, but the staff is working really hard to keep them clean and there are views of Hudson River, Jersey City’s skyline and the Statue of Liberty (in the distance but still). The toilets were in European style, really good compared to the horrible public toilets you see in many places in America. At one occasion we visited the public toilets of Waldorf Astoria, and they were really bad compared to the Jane. There are also bigger rooms with private bathrooms available, but in that case you have to pay about the double amount, and then you have to compare it to better hotels. The most annoying thing about our stay is that the hotel very unclear about that tax and deposit fee is not included in the price, and they didn’t even tell us about that, so about 200 dollars extra was charged from our credit card! We couldn’t figure out what the extra fee was.The first day in NY was partly spoiled since we had to go back to the hotel, go to the bank and talk to the hotel. So 3 different taxes plus a really huge deposit (I think it was 200 dollars!!) was charged, making the amount we should pay almost twice as big as there was info about at our printed booking request. A big WARNING about that, if you don’t have enough money on the account you can’t pay your visit, and it really feels like they try to fool people! Except for that, I want to say that they were really friendly and helpful during our stay. We had to cancel the last 2 nights, because we wanted to escape from the hurricane Irene, and that was no problem. We didn’t want to be trapped in a super small room in a building right next to Hudson River, in case of flooding and power failure. If you can stand staying in a small room without bathroom, the hotel is really good value considering the location, staff and condition, just keep in mind all hidden extra charges!